What's with kids nowadays? Why is beauty given such importance at a tender age? After the Oscars, I decided to watch Little Miss Sunshine just to see what was the hype all about, well I actually enjoyed the movie, only because in the end there's a different message. The kid goes for the pageant knowing that she's got stiff competition from barbies, those kids actually look older than their age, with all the make-up and stuffs, they even had a swimsuit and evening wear competition,the highlight of the competition would have been the talent show,Olive actually shocked and scandalized a bunch of audience by doing a strip tease style performance to the tune Super Freak, taught to her by Grandpa?? Kids nowadays are pressured at a young age to look good, heck some are even dieting at a young age, going for facial at 8 and laser hair removal at 10??? They began training at a young age and aim to be Miss World or Miss Universe some day... honestly the ones who are winning are like 18 but they look like 28... some contemplate in doing cosmetic surgeries,some don't even contemplate, they just do it, nose job la, lip implants la... gosh??? Let kids be kids, remember Jon Benet Ramsey?? 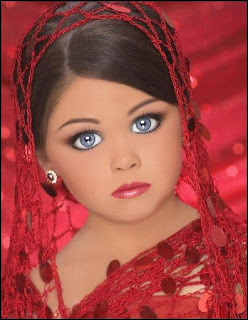 she was found murdered in the basement of her parents home by John Mark Karr a teacher... the kid got more attention than anyone because of her participation in beauty pageants... and she was only 6!! !For gawd sake, Let them be free, teach them art,music, educate them in a different way, teach them to love books and love themselves, not the either way around, how to wear mascara and eye liners... let them know beauty comes in various packages, and like wat Tupac Shakur said, " What is seen is temporary, what is unseen is eternal"
I had a fantastic childhood thanks to my parents, I played batu seremban, rounders, congkak, football using a tin can, we used to play netball back in school but we'll always end up playing futsal with it, we participated in debate,choral speaking and loads of other stuffs. So people teach your kids to appreciate their intelligence first through a different approach not through beauty pageants at a young age. If they want, they can join this stuffs when they can think for themselves, age should be taken into consideration,don't expose kids to this kinda media hype and attention, it would only take their childhood away. anyway, there's only one word to descrbe kids nowadays.... pampered... when i look at how my manager treats her daughter and how another family treats their new born.... i dread to see what the next generation will be.